Evapco - cAT - Cooling Towers - Factory Assembled - Cooling Towers by Evapco Inc. Warm water from the heat source is pumped to the water distribution system at the top of the tower. The water is distributed over the wet deck fill by means of large orifice EvapJet nozzles. Simultaneously, air is drawn in through the air inlet louvers at the base of the tower and travels upward through the wet deck fill opposite the water flow. A small portion of the water is evaporated which removes the heat from the remaining water. The warm moist air is drawn to the top of the cooling tower by the fan and discharged to the atmosphere. The cooled water drains to the basin at the bottom of the tower and is returned to the heat source. 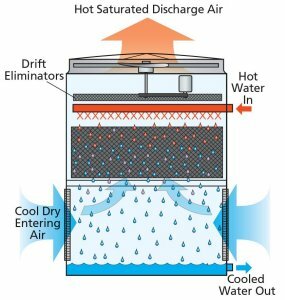 The vertical air discharge of the AT design and the distance between the discharge air and fresh air intakes reduces the chance of air recirculation, since the warm humid air is directed up and away from the unit. No reviews were found for Evapco - Model cAT - Cooling Towers. Be the first to review!